...to our second 2015 newsletter! We thought it would be good to send it out today to celebrate Dominic’s 41st birthday. Happy birthday Dominic! In this 5th edition we focus on the vital therapy that Dominic receives thanks to the fundraising efforts of the Trust. Padhraig O’Loughlin, Dominic’s brother in-law, kicks off with an overview of why this therapy is critical for Dominic. We also want to highlight the work done by Dominic’s sister, Mary, and his wife, Tara, on helping to launch Acquired Brain Injury Ireland’s latest campaign, 'Don’t save me, Then leave me,' in Dublin. I’d like to open with a note about Dominic from a musculoskeletal perspective (given my experience and daily involvement in these kinds of matters), with a short explanation of his current status and the need for the therapy in relation to it. How is Dominic’s body behaving, and why is all this therapy that we are giving him so vital for him? To answer these questions I must begin at the beginning. It is somewhat incomplete to talk about how his body is behaving without going back to the controller of it all – Dominic’s brain. When you consider the brain as soft tissue encased in a protective shell, you can imagine the injuries sustained – irrespective of the helmet he had wisely worn – when he struck his head forcibly on one of the boulders on Dollymount Strand. Huge forces acted on his brain – acceleration and deceleration as he flew skywards and then dropped, and the impact itself. In medical jargon this sort of injury is called a diffuse (widespread or in many sites) axonal (the axons being the connectors between nerve cells) injury – DAI. Early post-accident images of Dom’s brain were ominous, in that although they showed no major bruising or collection of blood, they did show subtle, widespread changes which would lead to a diagnosis of DAI, with all its resultant complications – swelling in the brain and the eventual opening up of the skull to accommodate this. How did all of this effect Dom? Compare the brain to a tree, with its treasure of cognition, memory and higher order function in the foliage. Dominic’s main trunk and branches were violently shaken and the twigs that connect to the leaves snapped at multiple locations. Once the acute phase was over, which involved addressing pressure problems and ensuring that his brain was beset by no further insults, he (and truthfully we) entered a healing phase. But there is a fundamental problem with nerve cells. They are highly specialised and function in an almost miraculous way to bestow us with our sentience, our reasoning, our vast potential. However, they are very poor healers – slow, unpredictable and very delicate. It is not a good combination of properties when they are injured so thoroughly at such a scale as in DAI. Rehabilitation Hospital in Dun Laoghaire and was assessed, Dominic scored very poorly and was given the grimly familiar title, ‘persistent vegetative state’. This meant he had to give up his space there for someone with better scope of rehabilitation. Then Dom had a lucky break – he managed to get a place at the Royal Hospital in Donnybrook. Here he received specialist therapy by experienced, dedicated hands in addition to what he received at Donnybrook, and arguably even more efficacious than that delivered in NRH. But if Dom is in a persistently vegetative state, why this additional therapy? If the NRH have decided that he does not warrant such therapy at their centre, then why persist? Is it all futile? Without any therapy, Dominic woul stiffen. His legs and arms oul straighten. His joints would develop contractures whereby the tendons and ligaments no longer pass smoothly but rather act as cords to limit motion. The soft tissues about his joints would harden and restrict him. Assessment showed no convincing evidence of higher order functioning, but it did show that Dominic processes pain and discomfort. We must keep Dominic as limber as possible for his comfort, but also out of hope that he may regain some function, some cognition. If indeed that does come to pass, we must ensure that he is not doubly betrayed by his body. He can’t currently consistently execute even the simplest of movements, and they must be performed for him. The muscles that power those movements must not be allowed to waste away due to disuse. If he can one day command his body effectively again, that body must be preserved for him as much as is possible. I started working with Dominic in spring 2014. The work I do, which is called the Feldenkrais method, is based on the idea that we can learn to move, think and feel in novel ways throughout life. We work through the movements of the body to help people to form new possibilities for movement. This can be applied to people in pain, children with special needs or people who have suffered brain injury. My first impression of Dominic was that he was capable of responding to people, sounds and voices, though this was certainly not happening 100 per cent of the time. This has remained my sense, although we have had ups and downs. Since the start of this year I have focused on Dominic's left arm. Dominic’s left elbow was frequently pressed backward into the bed or chair. His shoulder was forward and his head turned to the right. This was a pattern that his body and brain took in response to the trauma. Rather than trying to 'fix' or correct this, I go with the shape that Dominic presents. So, I press his elbow a little more back and take his shoulder a little more forward. In this way I take over the work of his nervous system and wait until he relaxes. When this happens several times, I begin to explore movements which are close to, but different from, Dominic’s pattern. This is a variation. I help Dominic to feel that he has a pattern, and then help him feel that he can do something different. I may accompany this with a verbal explanation. Another aspect of this work is using movement to help the brain form new connections. So, I hold Dominic’s wrist, and as I move it my other hand is on his shoulder. In this way he can feel that when his wrist moves there is a corresponding action in the shoulder blade. Focusing on two points gives the brain the possibility to join the dots. Adding a third element - touching an object that makes a sound, for instance - creates a context. Over the next weeks I will shift to Dominic’s left arm and to his fingers. In a nutshell, I want to show Dominic what he is doing, take the work over and supply him with the chance to feel variations. Lately Dominic’s arm has been more relaxed, and family and staff have noticed more movements, even some movement on request. Dominic has seemed more aware these past few months. Here is a video of Dominic in our therapy session, which will give you some insight into how Dominic responds in our sessions. I'd like to express my deep admiration for all of Dominic’s family and carers, for their determination and courage. A review of two recent scientific journal articles that help outline the importance of physiotherapy for Dominic. Physiotherapy is a health care profession that helps to remedy human (and animal) impairments. It promotes mobility, function, and quality of life through examination, diagnosis, and physical activity. The physiotherapists who work with Dominic (and other patients with disorders of consciousness [DOC]) are treating impairments caused by damage to the central nervous system (namely upper motor brain lesions). These impairments include reduced joint range of movement, diminished muscle strength, increased muscle tone, loss of functional independence, vision and balance. In reviewing scientific journal articles, it is clear that the treatment techniques that physiotherapists apply, play a critical role in the care of DOC patients. Fortunately, there is an expanding body of evidence addressing the effectiveness of interventions utilised during rehabilitation. In 2013, neuropsychologist Joseph T. Giacino, PhD concluded that the unwarranted pessimism about recovery from a DOC injury risks premature withdrawal of care soon after injury. Current healthcare practices often exclude patients who survive with prolonged disorders of consciousness from active rehabilitation, even from programs with expertise in this area. Recent outcome studies with long-term follow-up, however, have demonstrated that recovery may evolve over several years with a substantial proportion of patients eventually achieving some level of independence in activities of daily living and employability. Thus, careful diagnostic assessment and comprehensive multidisciplinary rehabilitation should be strongly considered. Because medical complications are common in this population and may undermine functional recovery, rehabilitation programmes need to have the capacity to diagnose these problems early and to employ a systematic approach to therapeutic management. In the absence of empirically established standards to govern the selection of rehabilitation interventions, treatment should centre on mobilisation strategies aimed at promoting conditioning and general health. Although it is unclear whether these treatments can facilitate neurologic recovery, there is little reason to doubt that they minimise the risk of complications and there is no evidence that they are unsafe. Some of the latest scientific research, published in February 2015 by neurological physiologist Julie Latchem and others, examined family perceptions and experiences regarding physiotherapy and its benefits for vegetative and minimally conscious state patients. Their results concluded that families place great significance on physiotherapy in relation to six dimensions: "Caring for the person"; "Maximising comfort"; "Helping maintain health/life"; "Facilitating progress"; "Identifying or stimulating consciousness" and "Indicating potential for meaningful recovery". Physiotherapy can make an important contribution to supporting this category of patient group and their families, but it is vital to recognise that family understandings of physiotherapy may differ significantly from those of the physiotherapists. A genuine two-way dialogue between therapists and families about the aims of physiotherapeutic interventions, potential outcomes and the patient’s best interests is critical to providing an appropriate service and establishing positive relationships and appropriate treatment. In conclusion, implications for families of people in a persistent vegetative state, or minimally conscious state, consider physiotherapy as a vital part of good care. In our continuous search for new therapy ideas and ways to engage Dominic, one idea that we have been investigating for Dominic is functional magnetic resonance imaging (fMRI). In this piece, Arun Bokde, a SFI Strokes Lecturer in Neuroimaging at Trinity College Dublin, helps us understand what fMRI is and how it works. Till date, such work with people in Dominic’s situation has been done in the UK or beyond, but never in Ireland. We hope to change that. Research is being done to develop new approaches that do not rely upon behavioural responses by the patient; for example, by using functional magnetic resonance imaging (fMRI) or electroencephalography (EEG) to measure activity in the brain in response to a stimulus (for example to light or voice) or to measure baseline brain activity. For example, when a description of a place is voiced to the patient, the brain response is measured; the objective being to see if the response to the voice description in a patient is similar to that seen in healthy individuals. While a ‘normal’ brain response is encouraging about the presence of awareness, it is by no means sufficient to conclude that a patient may be aware of his or her environment. Many brain responses are automatic, for example, a healthy person cannot choose to NOT understand one’s native language, or to not hear a sound. Stronger evidence of awareness is for the patient to demonstrate willful changes in brain activation, that is, patterns of brain activation where the pattern and timing of the changes can occur only if the patient is engaged in performing the requested activity. A challenge with this approach is that it is a very demanding task even for a healthy person, and the injuries that the patient may have suffered may not allow for the sustained activity to be performed. Another alternative is to measure activity across specific brain networks and measure how the regions in a network interact with each other. The similarities and differences between patients and healthy individuals may provide a measure of the brain integrity in the patients, and perhaps, a potential measure of level of awareness in a patient. The methods that are used for these approaches are powerful and offer great promise but they themselves also have their own limitations. EEG measures electrical signals from the brain at very high time resolution but suffers from a relative lack of spatial resolution (where is the signal coming from?). fMRI has very good time and spatial resolution for measuring brain activity but given that it relies on blood flow changes in the brain as a measure of brain activity, injury to the vasculature in a patient may render this measurement technique unusable. fMRI is also very demanding to use and is unlikely to be practical as a day-to-day clinical method but EEG may eventually become the practical approach for regular clinical use. The research being performed in these areas is increasing, and initial studies have been promising; and, at the same time, we are gaining a better understanding of the challenges of using these techniques for measuring level of awareness and ‘brain health.’ In the long term the potential benefit may be that if a patient has a demonstrated level of awareness it opens the door to rehabilitation interventions as a patient having awareness of the self will more likely be judged to benefit from such interventions. On the 24th of September Mary and Tara bravely took part in ABI’s launch of its national campaign, which featured Dominic’s story. In the morning Tara took to the airwaves, along with Barbara O'Connell CEO of ABI, to speak about Dominic and the many people suffering with acquired brain injury in Ireland on Today with Sean O’Rourke. According to government figures, 36,000 people in Ireland are living with ABI. ABI Ireland’s ‘Don’t Save me, Then Leave Me’ campaign is a call-to-action for the government to address the lack of services for people living with acquired brain injury. Tara spoke about how lucky Dom is to have a place, for now, in The Royal Hospital Donnybrook and about the difficulty living with the uncertainty surrounding Dom’s future care. Tara also spoke about how The Royal Hospital enables Dom and Sonja to have an ongoing relationship, and his friends and family to be a regular part of his week for the last four years. Given its excellent round-the-clock-nursing and the neuro-therapy that Dom needs, she emphasised the centrality of him remaining there. Mary Morrogh then launched ABI’s campaign outside the Dail, followed by a powerful and moving speech that highlighted the lack of services for people like Dominic. In her own words, ‘Each year over 13,600 Irish people in Ireland acquire a brain injury. What about these people who had accidents and did not die? What about the lives that are saved in the acute setting? Where, where are those people? How are they? How do they live? How are their families? The system has no record. The system cannot answer those questions. We urge you to take the time to sign our petition and pass it on to your friends, family and colleagues. I love running, and I have always wanted to organise a race to fundraise for Dominic. The annual women’s mini marathon, which takes place every year in Dublin City on the June bank holiday weekend, was the perfect opportunity to get a few people together for that purpose. The girls were not too thrilled by the idea of running 10 kilometres but gladly offered to make a donation. In the end, it was Eimear Cahill and I doing the race. The day proved to be very blustery, cold and generally pretty miserable. However, the weather did not dampen our spirits and we completed the race in an hour. It was a first 10-kilometre race for Eimear and she did not stop once, overtaking other runners, and finally reaching the finishing line. What a great sense of achievement to have finished the race and raised money for Dominic. We celebrated this achievement with Tara and Sonja in “House” on Leeson Street with tea for Eimear and prosecco for me. I am hoping that more of you will join me for the women's mini marathon next year. Please stay active to keep Dominic active! I ran The Great North Run from Newcastle to South Shields for Dominic, who is my first cousin, and received magnificent support from friends and family alike. This half marathon is one of the most popular of its kind in the world with over 57,000 runners completing the course this time around. I managed to secure a charity place for the race and set myself a target of 90 minutes to complete it. Although my training was mixed, I managed to complete it in 1:27:38, so I was pleased with that. In total, I managed to raise well beyond my target as the generosity from friends and family was boundless; the donations kept rising and rising. There was a really great togetherness pre and post-race and I hope this is reflective of the support and efforts that everyone associated with the trust puts in on a daily basis. The first time I visited the Alps was in 2010 on a ski trip organised by Jeremy "daddy" Svejdar. Together with Dominic, Cronin, Johnson, Gareth, Dualta, Conway and James Murphy O'Connor more time was spent on the piss than on the piste! Bar the great craic, food & fondue, my abiding memory of the trip was the sheer size and scale of Mont Blanc and the numerous mountains ranges encircling it. After many hiking trips in Ireland and in the north of Spain my appetite for something more challenging had become intense. I felt a return to the French Alps where I had skied with Dom was long overdue. It was time for me specifically to hike one of the oldest mountain trails in Europe called the TMB - Tour du Mont Blanc, while at the same time raise money for the Dominic Morrogh Trust. So last July I set off, and over a period of eight days hiked all the mountains that encircle Mont Blanc, covering a distance of 170 km through France, Italy, Switzerland and back to France with a total accumulated height climbed of 30,000 feet, or nine Carrauntoohills! Although at times the days were exhausting, with an average of 10 hours of hiking steep ascents and descents per day, I was always rewarded with breathtaking views, warm mountain refuges and fantastic mountain grub! I finished my Tour du Mont Blanc, hiking into the French alpine town of Chamonix where five years previously I had such a memorable trip with Dominic and the rest of the Glenstal lads. In particular, I recalled a fantastic evening in Chamonix with Dom where, although encircled by hundreds of English fans, we out-shouted, -screamed and -sang them to witness a glorious victory for Ireland in the six nations! A hot port was the tipple of choice for The Dinner Ladies for Dom relay team following one of the most windblown and wettest days in the Cork City Marathon’s history! Jennifer O’Shea started the race on Patrick Street at 9.00 am sharp, and the Cork based supper club, situated at various handover points around the city, ran their hearts out for Dom and for all the friends and family who supported the fundraiser. Huge thanks to all The Dinner Ladies: Niamh Carroll, Sarah O’Regan, Joani Treacy, Jennifer O’Shea and Aoife McCarthy. We hope you had a celebratory bite-to-eat following that gruelling race! 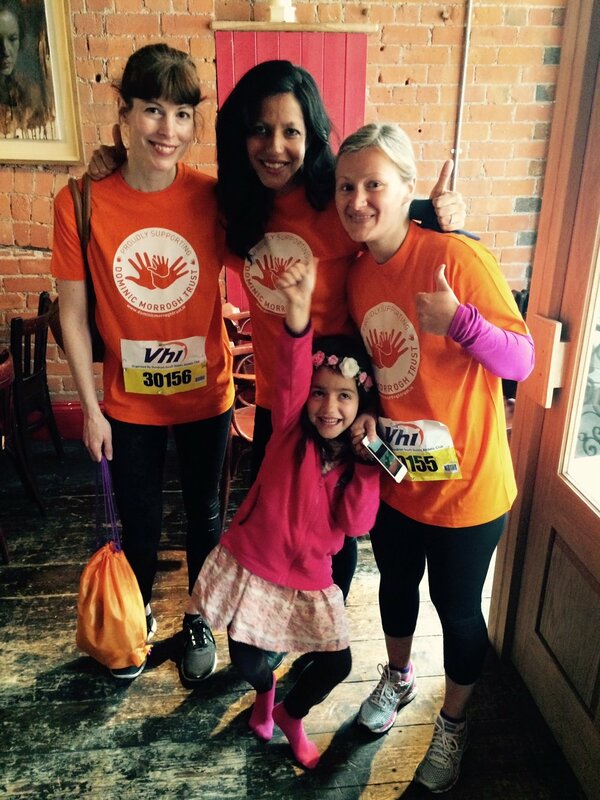 In late September, Flora participated in the Cork Womens’ Mini Marathon, raising funds for Dominic in the process. “I felt very privileged to be able to do something to help Dominic in some small way. I’d like to thank everyone who sponsored me in raising money for such a great guy!” Thank you, Flora, for all of your hard work and support! Des Bishop staged a live DVD recording of his “Made in China” show on 5th of September at the Everyman in Cork. It was a fun evening, with Des humorously recounting his year long journey of living, working and soaking up Chinese language and culture. Des generously donated all proceeds of the evening to the Dominic Morrogh Trust. Thank you so very much, Des! This summer, Tara’s colleagues in Trócaire held a summer picnic with a twist to raise funds for Dominic. Due to nasty weather, the picnic was moved indoors where staff had a better view of the entertainment - two brave men; Sean Farrell and Tommy Dillon offering their lovely legs up to be waxed! In advance staff made donations based on whose legs they wanted to see being waxed, and during the waxing itself a bidding war ensued where staff were pledging money NOT to have to remove the wax strips! which resulted in some very generous donations for the Trust. Thanks to all who participated and helped to organise! Good friend of Dom’s from his eBid days, Lorraine O’Neill, founder of the LA College of Creative Arts, and her amazing staff (especially Abbie and Anna), organised a Halloween fundraiser for him. Incredible outfits, food and drink defined the night. Thanks to all involved in creating this fun evening. A fun filled afternoon of cake, tea and crafts was held by Caterina, Tara, Sonja and Elena (Dominic's goddaughter) on November 14 in Dublin. The afternoon was full of friends and family catching up and supporting the Trust Fund. The best sales people on the day were the two girls, who for the first time opened their own stall, selling Christmas decorations, bookmarks and jewellery. Needless to say both girls sold all their products and donated it to the Trust. Thank you to everyone who came and supported the event. We are hoping to make this an annual event! There will be another craft sale in Cork on Saturday, December 5, for those who couldn’t make it up to Dublin. On Saturday, November 28th, we (all of us McGoverns, Rory, Mary, Eoin, Orla and Miles) hosted an Indian cooking demonstration and dinner at our house near Bennettsbridge, Kilkenny, for Dominic, who is Rory’s first cousin. But to do it we had to bring in the professionals so Tara, Sonja junior and senior, Narinder and Galina came down to show us how Indian food is made at home. The afternoon began early with the Bedis arriving laden with prepped food and spices. Soon our Irish kitchen took on an exotic flavour. Eoin got some useful tips in cooking for the masses which should help him spice up his student ‘prinks’ parties. By evening's end having demonstrated to and fed 46 of our friends, Tara had the rugby playing guests moving in mysterious ways with a flash mob dance number. A special evening with special people. A big thanks to all those who attended and supported our event. We wish to cordially invite you to join us for drinks and food at the beautiful Blackrock Castle in Cork on Wednesday, December 23rd at 7 p.m. in aid of our good friend Dominic Morrogh. We are delighted to announce that Dave Mac of Red FM will be the master of ceremonies for the evening. And we are also delighted to announce that our good friends in Rubyhorse have offered to play a few songs on the night!!! We are in the final months of our Global Fundraiser for Dominic, with the goal of purchasing a standing wheelchair for him. The trust has received many generous donations over this past year, however, in order to reach our goal, we still require more…..
Help Freely Foundation--Donate to the Trust while you shop online! We have teamed up with Helpfreely.org so you can now raise funds for Dominic’s recovery for free when you shop online. Whether you are living in Ireland, the UK, the US, Germany, France, Italy, or Spain, you can register now to start supporting the Trust each time you shop online. With some of your favourite stores to choose from including eBay, eBookers, Groupon, Nike, Debenhams, and hundreds of others, each one of your online purchases can make a difference for us. By simply downloading the Helpfreely App™ you will be notified when you are shopping at a charitable store and will never miss out on an opportunity to raise funds for us. Please share this link - http://helpfree.ly/j3283 on Social Media to encourage your friends to support us by using Helpfreely.org this Christmas season!